after a members little did at militaria collectors not being experienced at judging nihonto. 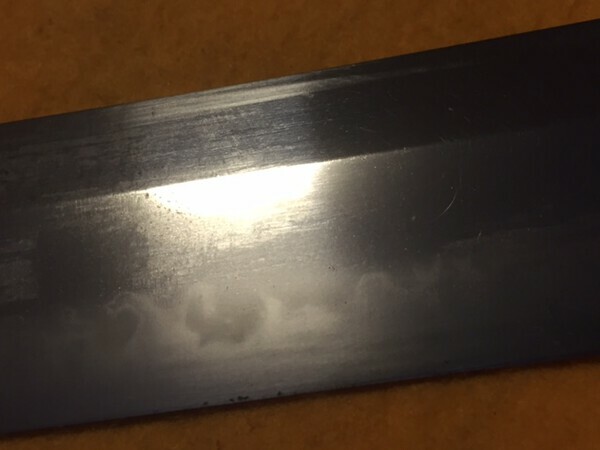 Minamoto yoshichika also reportedly made gendai and used imported steal, and was working before the period requiring non-traditional blades to be identified. 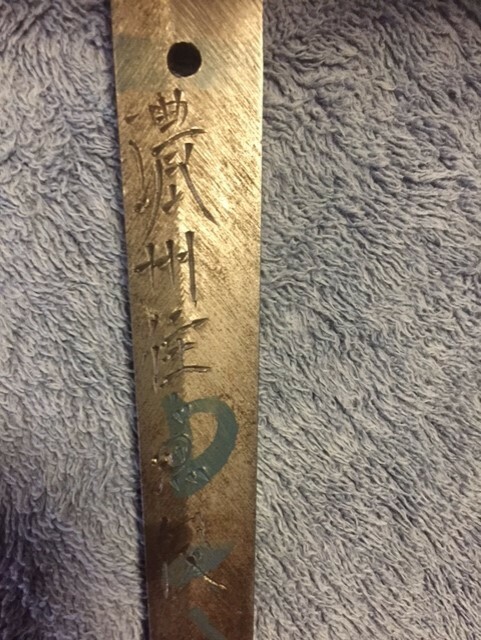 so could this possible help identify a so called gendai made with imported or rolled steel. 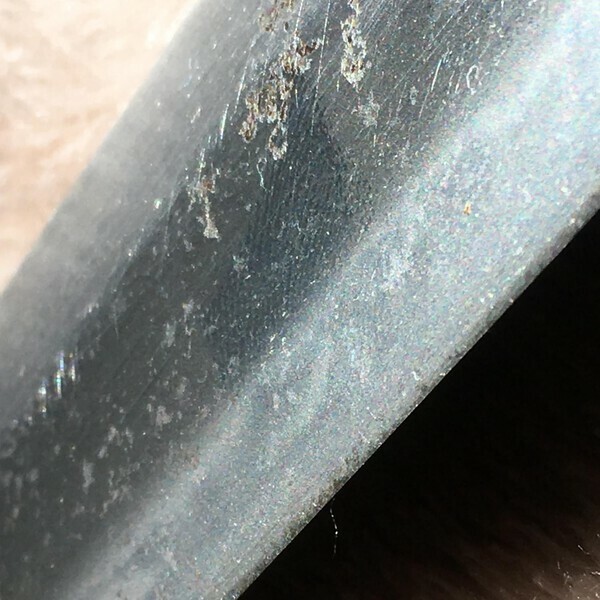 I'm testing/challenging my own opinion as to "once a RJT STAR stamped blade bears a micro SEKI, SHO or NA stamp on any part of the blade that the blade is only 95% gendaito if you get my meaning, as a very small amount of work or materials are not 100% traditional and the blade has been marked to help identify it. Hamish, as to a couple of smiths mentioned, Which Kaneshige? Which Kanenaga? Also, I have never seen a Kanehide made showato. I believe that the mini stamps are just to show which Amouries (Arsenal) these swords came through. I am led to believe, RJT were collected at these points to be issued and have nothing to do with inspections as regard to Showato. First there is a mountain then there is no mountain, then there is. Like to know where you were told that the small seki stamp on a star-stamped blade indicates non-traditional. As far as I have seen, and far as most here believe, a star RJT stamp means Gendaito. Period. The small seki stamp is not the same as the larger one, and does not indicate what you mentioned above. Where are we suddenly fabricating 95% Gendaito from suddenly? As requested Hamfish, photos attached photos of my MURAYAMA KANETOSHI. It has a star stamp, and small stamps on MUNE. This is a nice GENDAITO, which in fact David has seen, and highly recomends a professional polish. Hope this settles the confusion. "Jumei Tosho smiths also made blades using non-traditional materials, mainly forged mill steel. Blades with star stamps and which show nie in the yakiba are considered by some collectors to be gendaito"
​would this statement implie that a star stamped blades that lacks any nie in the yakiba or above the hamon are not gendai??? or am I mis-reading. from all I have read the Star stamp states that they are RJT, and not that blade is in fact a gendai. ​I like what david suggested, but do all RJT blades bear mune stamps to indicate the armouries that received them?? I have seen atleast 1 STAR stamped blade with no mune micro stamps. ​I'm attempting to re-learn or understand what the standards are in todays nihonto society as they appear to change. . as I know someone who sent a RJT STAR stamped blade to Japan in the mid 90s and it was apparently destroyed and had his gunto fittings turned to him. also david asked which Kaneshige. Morita kaneshige page 63 on sloughs. ​hes only listed as making gendai, but the oshigata shown has a stamp removed. what and why?? was it a star or a seki?? also would anyone have a proven Minamoto yasachika made from imported steel?? Again Hamfish, reading and rereading your attached link, only reinforces my view that RJT made blades with a star stamp, are traditionally made from traditional materials. And agree with David and Brian that MUNE stamps indicate the supply chain through which they traveled. not sure deleting is appropriate, this seems good reference material and an educational discussion. I can highly recommend all threads from George Trotter in that forum if you search for RJT. 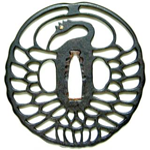 1. tosho mei and small logo stamp, eg "saka", and "na" etc (eg Ichihara Nagamitsu with "saka"). 2. Blades with mei (no date?) and star stamp made "on-site". 3. Blades with mei, date and star-stamp made "off-site" by Rikugun Jumei Tosho . All the smiths who made these swords were top quality smiths, so the presence of a star stamp or "saka" or "na" should not automatically dismiss the sword as "Militaria gunto". Jumei Tosho also made swords without star stamps, some with "contract numbers" on tang (not assembly numbers which are usually painted and correspond to the arabic numbers stamped on the fittings). Its a old thread but that was it written is actual. I like your theory. And while I agree the RJT smiths were to use tamahagane and traditional methods, it doesn't explain your observation of the blades with a Star and no arsenal inspector stamp. Theory - what if they were for a custom order, and didn't go through the arsenal? Another question is why are there small and large Seki, but only small Na for Nagoya? Anyway, Here's some shots of the blade on my Star/small-Seki stamped Kunitoshi, in Type 3 fittings. I don't know nihonto, so maybe you guys can tell if it's gendai or not. If you didn't meet the requirements, you didn't get a star stamp. If it has a star stamp, it's a gendaito regardless whether or not it has an arsenal stamp. That is unless it's a fake star stamp. Although if a sword by an RJT smith lacks a start stamp, it doesn't necessarily mean it's not a gendaito. I thought all of this was clarified & settled years ago. looks like all the hard work to find thw answer have been done. Clearly my understanding and knowledge on this topic is out of date and incorrect. So instead of asking members to wasting there time helping me chasing my tail. I will read and learn. As far as I'm aware, Star stamp swords were made for the war effort and not special order. If the blade does not have an extra Arsenal stamp, just means, it did not pass through one of those Arsenal (Armouries). There were official inspectors who I believe issued the star stamps and even collected the blades. One such inspector was, Yoshihara Kuniie. No need to delete any topic...we all learn from these discussion, and reminders are welcome. Interesting topic, I learned a good deal from this thread. David, I think we are meaning the same thing. There were many custom order swords for the war. I don't know the finer points of how it was done, but an officer with enough money could order a sword and it's fittings. It is believed by some, that the 3 digit stamped numbers sometimes found on kaigunto were "contract" numbers, meaning special order. If a well-to-do officer ordered one special, then like you said, it might not have "passed through one of the armories" but gone directly to the officer. But that is all just speculation! Interesting discussion. I have little to add but maybe it will be of value to just recount my knowledge of RJT smiths and stamps and showato etc. I am not the guru, but have had 40 odd years of interest in RJT and even abandoned koto-shinto-shinshinto for them alone. 1. About RJT rules. I suggest everyone read the translation of the rules and regulations that RJT smiths had to obey (Brian has it listed in the "interesting PDF's" section at the top of the index). In this you will see how strict the RJT scheme was on the smiths. You will see that everything was covered with a rule and that ANY left-over, rejected or broken/condemned tamahagane MUST be returned to the authorities. It does not specify anything about showato or using "some" tamahagane for other production. Because there is no mention of any showato process it is hard to imagine where the theory comes from. 2. About showato, I think it safe to say some competent gendai tosho made them...but I would say pretty definitely not as part of the RJT scheme. I personally have not seen a showato with a known RJT smith's mei on it. The only written evidence I have of this happening is from a list of 44 tosho who were members of the Northern Japan Swordforging Union. This was run by Kasama Shigetsugu and member smiths (including RJT smiths) in the northern prefectures above Tokyo sent their swords to his warehouse in Tokyo and he mounted and marketed them to military officers...I can't say if they put any in-house stamp on them during this preparation process. A note in the margin of this list states that 2 or 3 members also made showato. From my own research in Japanese books I would say that these 2 or 3 "dual" tosho were BABA Tsugukiyo (RJT), YAMAMURA Sukeyuki (RJT? ), and YANAGAWA Shoshin (Ushoshin) (RJT?) (Special Ranks - Betseki), but I would be surprised if any used any portion of the government supplied tamahagane or pine charcoal allotments to do this as the rules are so strict. For any given portion of tamahagane/charcoal supplied, the smith had to produce a required number of swords and return any left over material....another point is that if they did use RJT material would the sword be gendaito or showato? . 3. About stamps. This list includes the 2 Yamagami brothers, Akihisa and Munetoshi, of Niigata. Both were RJT and both also made private order gendaito. They (a) used tang "production?" numbers from 1941; the (b) star stamp with numbers from c.1942 and © also the "matsu in a circle" stamp with numbers from 1942 and (d) the combination of matsu/numbers/star is also found together. It is my opinion that the matsu stamp and number system was strictly that of the Yamagami brothers and as they worked together, these numbers "overlap" each other's tangs. I think the number system changed by 1944 when the more common RJT system of a katakana prefixed number appears. I think this may have been imposed by the RJT authorities and this style appears on many RJT produced tangs. I must say I can't remember seeing this numbering on any Seki Nakata Kanehide RJT tang however, so maybe not all RJT smiths had to use them. Kanehide does have katakana prefixed and also alphabet prefixed numbers (prob. assy. numbers) on his tangs but always painted. Whether bunches of numbers were allotted to only certain RJT smiths or they were a local "code" system I don't know. So, although we never say never with nihonto, I think the stamps are perfectly legitimate and should not disturb collectors. The idea that they denote "part showato" is IMO incorrect and the idea that "part-showato" RJT blades are around is also 99.9999% (IMO) unlikely. 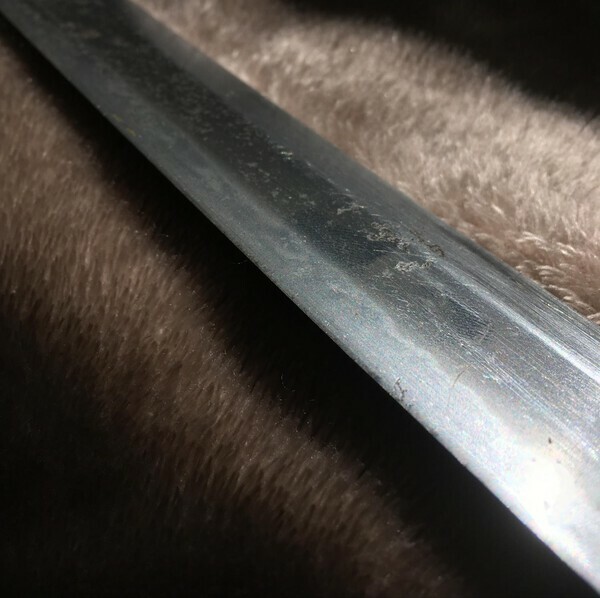 I will say however that I have seen a very good quality looking choji hamon blade by Kanehide in his usual metal scabbard Type Contingency Standard mounts that while correctly signed and dated by him had no star stamp or tiny stamps on the tang. A careful inspection showed that this magnificent sword has a very fine ha-giri in the choji. It is this that explains the lack of acceptance of this blade to the RJT scheme and thus...no stamps. The blade was permitted however to be sold into the military. 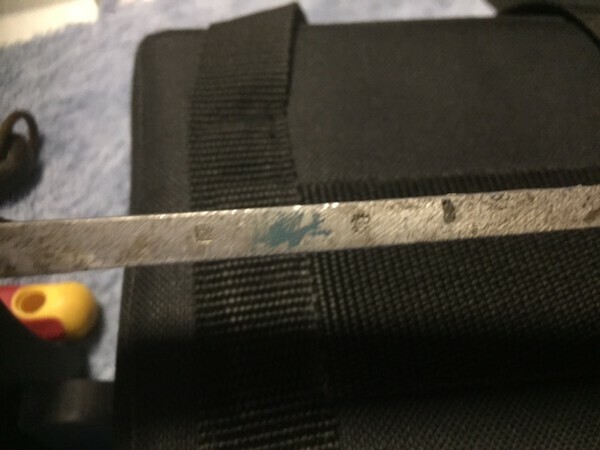 This blade alone kind of confirms how strict the RJT inspection standards were and so it is unlikely that "part-showato" swords would get through the system and get a star stamp or any other stamp. All very helpful, thank you guys. George, thank you very much for that detailed description. Fabulous info George, thank you!!! My Dec 1941 Akihisa has no star stamp. However, I haven’t viewed the nakago since acquiring it (I trust the seller and went by his photos pre sale). Maybe I shall have a look for any evidence of the other stamps mentioned. Just because a smith who is also RJT doesn't have a star stamp on a sword, only means this sword did not pass through the RJT system. RJT smiths made swords for RJT orders their own orders and special orders. Also, the RJT program wasn't implemented until the end of 1942, or the beginning of 1943. Given the date of mine, I’ve always put the lack of star stamp down to that. A fairly auspicious date though! Interesting stuff David! It fits my Star stamped blade. Like to see if anyone has a Star stamped blade dated prior to that. I didn't think to mention in the RJT Specifications documents Morita sensei sent me to translate are dated 15th and 20th April 1942 . These dates appear on the Japanese documents included in the translation PDF that Brian has posted (but I neglected to put the date on the translation).. The document suggests that the rural areas RJT scheme was "settled down and running" by April 1942 ( I would think those smiths working in the arsenal areas when the scheme was being established may have used the star stamp a bit earlier...maybe 1941?). I have a blade by the Niigata Prefecture Yamagami Munetoshi with no star stamp dated Sept 1941 and another, star stamped dated May 1942. This fits into the RJT document commencement date above...but remember this may just indicate the RJT start date of Munetoshi...other smiths may (I don't know) have earlier dated star stamped swords because they entered the scheme a few months earlier or perhaps even in the year 1941. I don't think we can be too conclusive about the first to use the star and/or matsu stamp as, as has been mentioned, many smiths including these two did "other" orders and these took time out of their RJT schedules/continuity. 5. The first time the RJT style number is seen is on a Munetoshi (2nd kanji changed) dated 3/1944 number "Ta"2353. Hope this helps you Yamagami owners and maybe it helps with the star stamp question. George, you mentioned that you have a sword with a Star Stamp, dated may 1942. This is the first time of heard of a Star stamp on a sword, pre 1943 and I have personally never seen one. Very interesting. No...my mistake...actually my Munetoshi with star is May 1943...sorry, brain freeze...I read it wrong. Tang number is Matsu 1008. A. Just another point I should have mentioned is that the lowest Yamagami tang number I have seen is 106 on Munetoshi 7/1941 (no matsu or star). From this small sample it seems that the RJT number system began with the brothers between 10/1943 and 3/1944. But there is a problem about it. I have another RJT blade tang with this system, he is also a "rural" smith: Nagao Kunishiro of Aomori...tang is dated 2/1944 and has star and number "O"154. Since Kunishiro "became RJT in 1943" (Ono Gendai Toko Meikan 1971 p.153 and Ono Gendai Toko kinko Shokukata Soran 1977 p.84) he would, I presume, have started using his RJT katakana prefixed numbers then, so between "mid/late? 1943 and 2/1944 he has made 154 RJT swords. The problem is that if the same logic applies to the brothers then between say about 10/1943 and 3/1944 they have made 2353 RJT swords...impossible...so I can't exactly explain the RJT system in relation to the brothers. Here is a Munetoshi dated November 1942 with a star stamp.. Thanks Hoanh, all good info.